Can be mounted directly onto the actuators IC 50. For processes that require high temperature accuracy and low circulation in the furnace. Actuator IC is controlled by a three-point step controller and moves the butterfly valve to the ignition position. The burner starts. 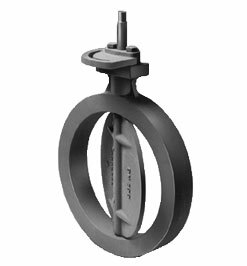 The butterfly valve opens or closes between the low-fire/high-fire rate positions depending on the capacity demand of the burner. When the three-point step signal is disconnected, the butterfly valve stops at its current position. Butterfly valve DKR..H with manual adjustment is used to adjust the high-fire rate. For processes that require a homogeneous temperature distribution in the furnace. Actuator IC..E is controlled by a two-point step controller and operates in On/Off or High/Low intermittent mode. The actuator closes when the voltage supply is interrupted. Butterfly valve DKR..H with manual adjustment is used to adjust the high-fire rate. For processes that require high temperature accuracy and low circulation in the furnace. Actuator IC..E is controlled by a (0) 4 – 20 mA or 0 – 10 V signal. The continuous signal corresponds to the adjustment angle to be approached and offers the option of monitoring the current position of the actuator. Butterfly valve DKR..H with manual adjustment is used to adjust the high-fire rate. Butterfly valve DKR is used on burners that are operated with preheated combustion air at temperatures of up to 650°C (1202°F). Maintenance cycles: We recommend a function check once a year. Click Here for Help choosing which DKR model you need.